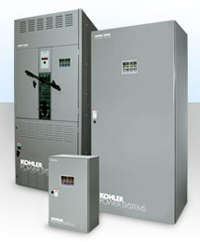 Bridging the utility with standby power is no small job, which is why KOHLERÆ transfer switches are indispensable to the all-KOHLER power system. All KOHLER transfer switches are loaded with sophisticated technologies and advanced design features that ensure transfer of power to critical-load applications. When power fails, power is transferred from the standby system within one-sixth of a second. And you continue functioning as normal. UL 1008 listed at 480 VAC file #E108981. Available in 2, 3, or 4 pole configurations. Electrically operated, mechanically held mechanism. Fully rated for use as a manual 3-position transfer switch. Bypass switch and contactor position indicators. LCD display, 4 lines x 20 characters, backlit. Dynamic function keypad with tactile feedback pushbuttons allows complete programming and viewing capability at the door. LED indicators: Source available, transfer switch position, service required (fault), and “not in auto”. Phase-to-phase sensing and monitoring with 0.5% accuracy on both sources. Frequency sensing with 0.5% accuracy on both sources. Phase rotation sensing for three-phase systems. Modbus® RTU and Modbus® TCP/IP protocols (Modbus® register map available). RJ45 connector for 10/100 ethernet connection. USB port with read/write compatibility.